This post assumes that you already have a Facebook page set up. If you need to add one, you can log into your Facebook account and click on pages in your left hand column. That will list all of your pages as well as give you a button to create a new one. 1. Create a new page on your website. In the right hand column, you’ll notice a box for “page attributes.” From the “page template” drop down, select the “Facebook Page” template and publish your page. There’s no need to add this page to your menu as we only want it to be visible on Facebook and not on your website. Once the page is published, you’ll need to copy that page’s URL to use later. This page will use the slideshow or video from your home page as well as widgets that you can select by going to Appearance>Widgets. 3. Now you’ll be ready to fill in the information for your app (see image below). At the top of the “Basic Info” page, you have a chance to upload a custom icon for your app if you’d like to. For best results, use a square graphic. Below that you’ll see the “Basic Info” box. Facebook provides a ? next to each field to provide some contextual help in filling out each blank. Give it a descriptive name that is specific to you for the app. You’ll also need to enter a public email address that you don’t mind being visible to others. Down below the “Cloud Services” box you’ll find several checkmarks. Select the one beside “Page Tab” and fill in the information there. The “Page Tab Name” is the name that will actually be on tab in your Facebook page (you can change that from inside your page later). The “Page Tab URL” is the page on your website that you created earlier using the Facebook page template. Enter the URL to that page here. Facebook now offers secure browsing to its users, so if you have SSL certificate for your website, enter a URL for the https version of your site. If you don’t have one, you can just copy the URL to your page and replace the http at the beginning of the URL with https. The click save changes. Now click the “Add To My Page” link in the left hand column. 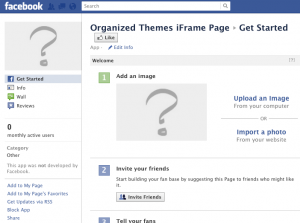 You’ll be presented with a pop-up with your available Facebook pages on it. Select the one you’d like to use and you’ll now have a custom tab on your Facebook page. 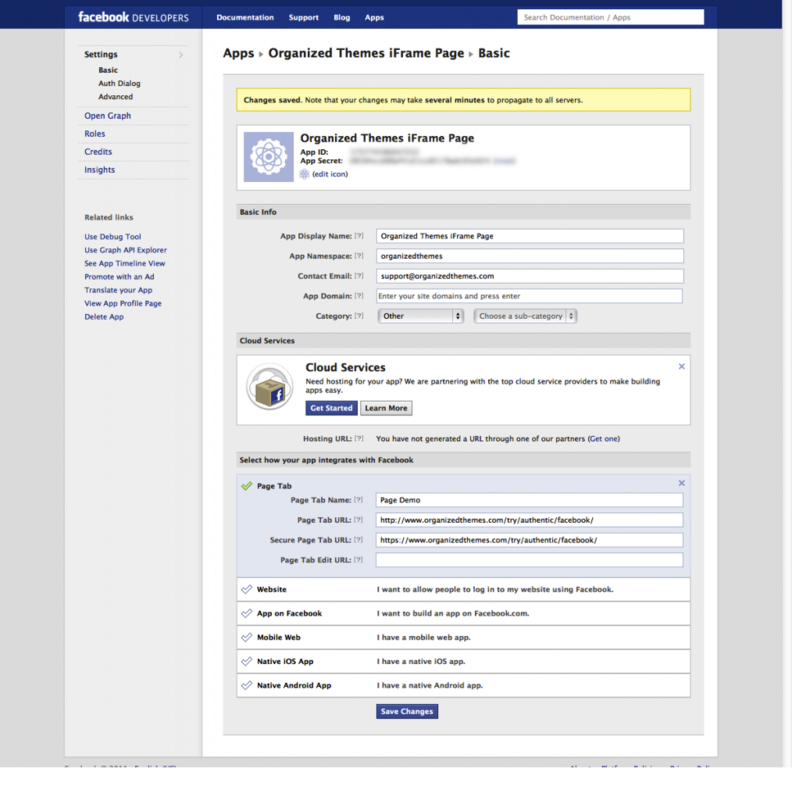 Be aware that changes to your app sometimes take a few minutes to propagate across Facebook’s servers. That’s pretty much it. There are some other options available for your app if you look at advanced settings on your app’s page at developer.facebook.com. If you’d like to further modify it’s options you can do so there.